EROI = Energy Returned On Energy Invested - The Peak of World Silver Production may be just around the corner due to a falling EROI (energy returned on energy invested). This will also be true for most industrial metals. I may go as far as to say, if the Global Economy does not make a full recovery shortly (which I doubt), 2008 could be the all time peak for world silver production. At least, the world production of silver will be in a plateau as unconventional oil supplies start to peak and decline. We have two problems concerning the mining industry. First we have the numerous Black Swans ready to take down the Global Financial System in the immediate future, and secondly, the falling EROI ratio that will provide less net energy for mining into the not so distant future. One deals with the evaporation of credit to fund new and existing mining projects in a Global Financial Meltdown, and the other limits the production of future mines to those companies who have the best quality high grade ores. I was inspired to write this article by reading “Mexican Silver” by Bob Moriarty. Mr. Moriarty stated that Mexico has so much silver, the country has barely been scratched. Even though it is true that Mexico has plenty of silver, it takes a great deal of energy to explore, develop, mine and produce this silver for market. Very few, if any analysts understand the falling EROI ratio and its impact on the future of the mining industry. To understand the EROI ratio, I would direct the reader to check my previous article: THE MOST IMPORTANT ASPECT MOST ECONOMISTS AND ANALYSTS FAIL TO RECOGNIZE. You can find the article HERE. The reason for the falling EROI ratio is due to the increasing energy investment and technology to extract the more difficult and harder to get oil. Back in the 1930’s the great oil boom in the United States produced 100 barrels of oil for only 1 barrel of oil invested. Those were the good ‘ole days when lakes of oil were just sitting there for the taking. Today, we find oil companies like BP and Exxon building and putting into service THUNDERHORSE, the largest offshore oil rig in the world at an expense of $5 billion to tap into deep water oil to feed the insatiable energy demand of the USA. It still amazes me to this day just how many people believe that there is a GRAND CONSPIRACY to cap wells in the United States and exploit cheaper foreign oil. It never fails, when I meet someone for the first time and the discussion of peak oil comes up, a good percentage have this knee jerk reaction that they know someone in the oil industry who told them we are capping our oil wells to use up foreign supply first. Now If I feel up to it (which normally I don’t), I ask this Einstein why on earth would U.S oil companies build billion dollar off shore oil platforms, deal with hurricane force winds and waves, salt water corrosion, sea floor pipelines and highly paid technicians if they can do the same thing at a fraction of the cost on land in the states? Normally, the reaction I get is this glazed over stare as their brain tissue tries to come up with something to counter that argument. If I notice they are having difficulty understanding that example I give them another. I say, what farmer would pump water from a distant state to irrigate his crops, if he could pay a fraction for the water which he could access near his own property? Maybe then, some of these people finally understand just how silly the notion of capped U.S. oil wells really sounds. Before I get into some interesting facts and data about EROI and the Mining Industry, I have to discuss what I call as REVERSE ALCHEMY and ANALYST HYPE. During the Middle Ages, those who performed Alchemy tried to turn lead into gold. It was never successful, but many poor slobs wasted the better part of their lives trying to make it rich. Today, we have the opposite. Thus, grown men are now slapping each other on the back because they have learned the great secret of turning gold into lead. A perfect example of this in work is the Canadian Oil Sands Operations. The Oil Sands Operations in Alberta, Canada have found that by using huge amounts of natural gas and excellent quality fresh water from the Athabasca river, they can take sand mixed with tar molasses and produce oil for the market. Just think about that for a minute. At one time in the past, high quality light sweet crude was so easy to extract, it just came out of the ground under pressure all by itself. Today, a falling EROI has turned the oil gushers of the past into huge strip mining operations. Vast amounts of potable water and natural gas are necessary in modern day Reverse Alchemy to transform oil sands into oil for the market. Basically turning gold into lead. What in the world will we think of next to top that one? Well, what do you know, the present day alchemists have come up with another example. It’s called the wonderful world of Shale Gas. Shale Gas wells are such LOSERS, only 28% of them return a reasonable profit. The only way it can be sold to the public is by ANALYST HYPE. There is this grand illusion that because we now have a huge glut of natural gas in the United States, it is time to export the surplus and sell it for peanuts. Not only are energy analysts guilty of propagating this nonsense, many energy companies have joined the bandwagon. Prices of energy are traded in such an incredibly insane system, it behaves as if humans have a lifespan of a gnat. This is the same kind of lunacy the grand oil gurus were stating back in 1999 when oil was $10 a barrel. The oil analysts back then were saying, because there was such a glut of oil on the market, oil would drop to $5 a barrel a stay there for a decade. Silly forecasts from silly people. Today we find, nothing has changed. The Barnett Shale Gas Field in Texas was the only field of its kind exploited to a large degree due to the higher price of natural gas in the past. It was this high price of natural gas that allowed these energy companies surplus assets to invest in the high cost of long extended horizontal drilling and hydraulic fracturing to exploit the Barnett Shale Field: 60-70% depletion rates are normal for first year drilling in these shale gas fields. The Canadian Oil Sands Operations and the Shale Gas Plays are great examples of Reverse Alchemy by a falling EROI. These analysts and energy companies hyping the shale gas fields as the next savior to our energy needs, are in a sense, destroying future production by giving away the present for a song. They are behaving like flesh eating bacteria devouring the patient from the inside out. If oil and gas prices do not head higher, future supply will be destroyed like never seen before. Production justified by $90 price, from Horizon Oil presentation. 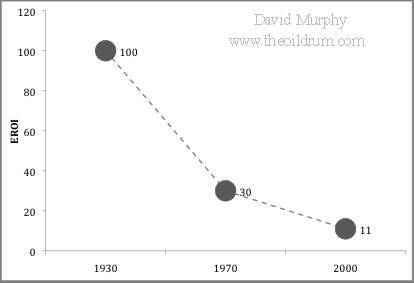 Deflation of energy prices were possible in the 1930’s due to the high EROI of about 100:1. Because of the much lower EROI today, if we had deflation of energy prices (and they remained low), production would be destroyed from the top down. By looking at the chart above, if oil fell and remained at $20 a barrel as some deflationary analysts forecast, we would have more than 50% world oil supply destruction. And by that, I mean the companies that have the highest cost per barrel like the Canadian Oil Sands would be one of the first to cut production. The higher the cost of production the lower the EROI. To understand how a falling EROI will affect the mining industry, we need to take a look back in history. I am amazed at the lack of understanding of the declining ore grades worldwide by the analysts who are so called specialists in this field. In acquiring the research for this article, I had email correspondence with several analysts who seemed quite surprised at some of the graphs I had found. Some even asked where I had found this information and who was the source. I then began to understand most of these analysts really didn’t have a clue on how a falling EROI would affect the mining industry and its declining ore grades. If we go back to ancient Greece, we find they mined silver and lead from the Laurium (Laurion) massive sulphide ore district southeast of Athens from the 7th to the 1st century BC. For 600 years the ancient Greeks mined 13 Mt (million tonnes) of ore with an average grade of 20% lead (Pb) and 400 g/t silver (Ag); the extracted metal was estimated to be about 1.4 Mt lead and 3,500 tonnes of silver. More recently, between the years of 1865-1977, the same district produced 30 Mt with an average ore grade of 3% lead and 140 g/t silver; the extracted metal was approximately 0.9 Mt lead and 4,200 tonnes of silver. Although man began to mine silver on a small scale in about 2500 B.C., Patterson says that it was not until Rome took control of the silver mines in Iberia that it was able to attain the economic strength necessary for the rapid expansion of the empire. Silver production, mainly in Iberia, peaked between 50 B.C. and 100 A.D., when some 30,000 tons were extracted; Roman legions were furnishing 30,000 fresh slaves a year then to maintain the ranks of miners at 150,000. The amount of silver and lead the Romans exploited from the Rio Tinto mining region in Iberia (Spain) was so large, they left an estimated 6.6 million tons of slag from their smelting operations. French and Australian scientists using ice-core analysis estimated that between 366 B.C. and 36 A.D., when Rome was at its peak, 70% of the total global lead pollution came from the Roman mining operations from the Rio Tinto. After the collapse of the Roman Empire, global lead pollution declined and did not reach the same level again until 1523, during the period of the Renaissance. If we fast forward to the 19th and 20th century, we find an interesting trend. 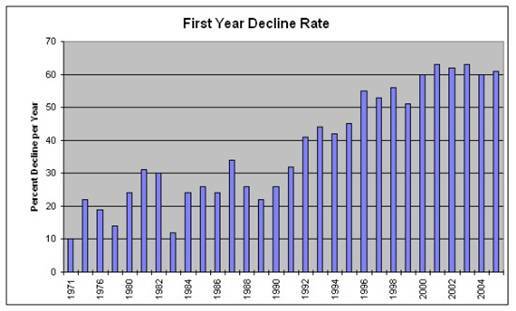 A trend of steep declining ore grades. From the time of the Greeks, Romans and up to the industrial revolution, most of the mining was done by human and animal labor. This pre-industrial physical labor seemed to work fine as the ore grades were extremely high and condensed in a relatively small area of veins. As the low hanging fruit of high quality ore grades were exploited, the mining industry had to reinvent new ways of making declining ore grades economical. It was both the invention of new machines and technology as well as the tapping of high EROI coal and oil of the late 19th and 20th century did the mining industry solve its problem of declining ore grades. You might say, the discovery of the vast reserves of coal and oil in the world came at the perfect time to help transition the mining industry into the modern era. Gavin Mudd, from the Department of Civil Engineering in Monash University, Australia has done some very detailed work on the history of the mining industry in Australia as well as global trends in gold mining. We can see from the graph below just how much the ore grades have fallen in the Australian continent. The figures above clearly demonstrate how ore grades have fallen in modern times. Gold and silver ore grades in Australia have fallen more than ten times their original values whereas the base metals of copper, lead and zinc have fallen 8, 4 and 2 times respectively. The important thing note is the degree of decline from the figures in the 1880-1900’s to 1950-60’s compared to the slower declines from the 1950-60’s to present. The author of this article did not go into detail in providing declining ore grades in all the countries of the world as the information is not readily available in a condensed fashion. But, certain assumptions can be made. We know that ore grades declined first in Europe as this was the epicenter of advancing civilizations who needed gold, silver and base metals. The next great area of the world to suffer declining ore grades was the United States. This can be shown neatly in the graph below. 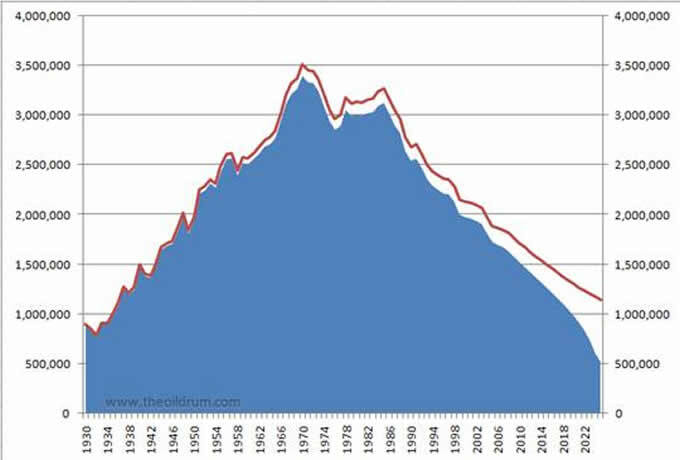 As a percentage of global mining, Europe peaked in the 1860’s, the United States peaked between 1930-1950, and the former Soviet Union peaked in late 1980’s. It is interesting to coincidence that the former Soviet Union peaked at the same time their country and economic system collapsed. As for Australia, it maybe in the peak plateau currently, but China and the 6 resource rich developing countries are still in their upward trend. The good ole days of finding bonanza gold deposits as well as locating elephant oil fields like Ghawar of Saudi Arabia, are gone. Today, the world is exploring for minute quantities of gold in tons of ore. Basically, we are left to mining gold dust. Sure, there are the occasional Aurelian finds, but they are becoming more rare each passing day. Below we can see how 5 different countries gold ore grades have declined over a period of time. In looking at the chart above, you don’t need to be an engineer to understand what is happening to the global gold mining industry. It is safe to say that 4 of the 5 countries listed above are now mining gold below 5 g/t, while United States, Canada, and Australia are below 3 g/t. Even though there are only a few countries represented in this graph, it signifies what is taking place in the global mining industry itself. As the ore grades fall, the amount of rock that needs to be mined increases proportionately. The increase of waste rock in mining low quality gold ore grades can be seen in the next graph. The higher amount of waste rock comes from the method of open pit mining. This is by far the choice of most mine developers when the ore is situated close to the surface. The removal of the vast amounts of ore and waste rock are done by large earth moving machines and trucks. Most of these machines and trucks are powered by diesel. As long as diesel remains relatively cheap and abundant, this type of operation can continue economically. Unfortunately, as the world peaks in oil production and the effects of EROI are felt, this type of mining will become increasingly prohibited. When the system of mining was limited to simple machines along with human and animal labor, the EROI was relatively positive. We know that simple hunter gathers and early farmers were able to produce food at a ratio of about 10:1. That is, it took 1 unit of energy (work) to produce 10 units of energy (food). The Romans were able to produce silver and lead at a relatively higher EROI compared to competitor nations as they had vast numbers of slaves who lived a meager existence. There is no science I have come across that measured the EROI of human and animal labor in the mining industry, but I would imagine it would be much higher than the Energy Devouring Method of Open Pit Mining…..as open pit mining is only allowable when liquid fuels come from a high EROI environment. Remember from what I presented in my first article linked above, high tech farming and modern transportation of food has an EROI of 1:16. A huge net energy loser. We can just imagine what it must be like for open pit mining. I would like to clarify how I use EROI in the mining industry. EROI is normally used to state the ratio of producing net energy. When we speak of human labor in producing food as an example, the net food remaining thus becomes the energy available for human consumption. In mining, it is difficult to compare an EROI as precious and base metals are used in many stages of production, manufacture and distribution in our labor saving modern economic society. Thus, it is safe to state that the more simple method of human extraction of higher grades ores in underground mines would have at least a positive EROI ratio, whereas open pit mining would show a negative EROI ratio and be a net energy loser. Again, this type of modern mining system will only continue with a relatively high Global EROI Energy Ratio. If we consider what is happening in the King of base metals, copper, the results are not much better. Copper is the most important base metal when it comes to the modern electronic world of ours. Technology would have not advanced to the degree today, without the increase production and use of copper. Furthermore, a good percentage of gold and silver come as a by-product of copper mining. 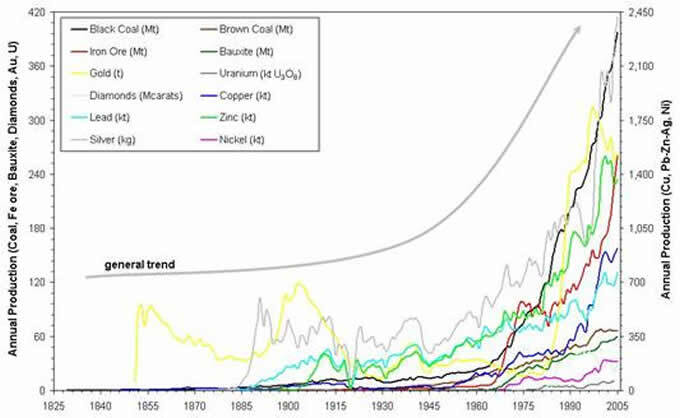 As the world ore grades of copper have fallen, the increase of waste rock and the energy to mine it have gone up exponentially. The slide above from Dr. A. M. Diederen’s presentation “Metal minerals scarcity and Elements of Hope” given at the Oil Drum/ASPO Conference in Alcatraz, Italy in June, 2009 shows that even though copper ore grades have leveled off in the 1990’s, the total Ore compared to the Metal mined, has increased substantially. It takes the extraction of 250 tons of solid waste to produce one ton of copper. As it takes more energy to produce the precious and base metals in the future due to declining ore grades, it is important to understand the relationship of energy and mining reserves. During the exploration oil boom of the early to mid 1900’s, the world was finding more oil than it knew what to do with. Those were the days when the massive discoveries of the Burgan Field in Kuwait (1938), and the Ghawar Field in Saudi Arabia (1948) added to the huge world reserves. Oil contracts at this time were done on long term fixed price contracts. For five years from 1948 to 1952 the price of crude oil was fixed at $2.77 a barrel. Here are the world discovery rates of conventional crude compared to production. Except for the two large blips in the late 1930’s (Burgan Field-Kuwait) and the late 40’s (Ghawar field-Saudi Arabia), the peak of discovery takes place in the 1960 decade. Even though the world peaked in oil discoveries in 1965, it did not peak in conventional production until approximately 40 years later. According to Matt Simmons of Simmons International, the actual peak of conventional crude was in May 2005 at 74.3 million barrels a day. You can see his presentation HERE. There is a lag from peak discovery to peak production of 40 years. If we compare the discovery of world oil fields to that of global mining deposits, a similar trend is taking place. According to this slide, world class mineral discoveries peaked in 1981, whereas the number of major deposits peaked in 1988. As one travels along the horizontal axis of the graph up to the year 2000 and onwards, discoveries of both world class and major deposits fall off a cliff. Matter-a-fact, once you pass 2001, there aren’t any. ZIPP. This indeed is a telltale sign similar to the World Oil-Discovery-Production-Decline story. All that is left to complete the last chapter of this book is to give the details as to the exact date when Global Mining Production will peak. It is always easier to point out the peak from a rear view mirror as it was when the United States peaked in oil production in 1970. The exploration expense during the years between 1995-98 peaked at $5 Billion dollars producing approximately 7 major deposits, but when we look at 2004 and onwards, $7 Billion dollars was spent with no major deposits discovered whatsoever. This is just as depressing as what is taking place in the Big Oil Companies. Last year ExxonMobil, Chevron and ConocoPhillips spent more money buying back their stock then they spent on new exploration. Maybe the oil companies know something we don’t. They probably realize that there is no money made drilling lots of dry holes. We have to remember, oil companies are not in the business to find oil, they are in the business to make money. The USGS, Energy Analysts and Wall Street Media talking heads will always drum up wonderful news about new large resource discoveries to the market. The Jack Field in the Gulf of Mexico and the Tupi Oil Field off the coast of Brazil comes to mind. For a few days the euphoria gives the public a new sense that EVERYTHING IS GOING TO BE OKAY. But after the Brainstem Buzz is gone, it’s back to good old fashion reality……and that is, we’ve got some serious resource constraints coming dead ahead. This is terrible news for the Suburban Retail Leech and Spend Economy of the United States. Unfortunately, many analysts and geologists are putting a present value on future low grade-high volume mines to be the saviors as replacements for existing mines which will be depleting each and every passing year. This is sure folly as a falling EROI ratio will curtail future net energy, making these kind of deposits increasingly uneconomical. The value of a mine that a bank will lend, is tied to its PROVEN and PROBABLE RESERVES, not its FUTURE INDICATED and INFERRED RESOURCES. Furthermore, a large portion of the so called resources and resource base of many commodities we see listed on the USGS website will become uneconomical as the effects of declining net energy head into high gear. For those readers who have just come across this new information, it sure can be an eye opener. As for others who might be skeptical, it seems quite unbelievable. At first glance it does seem a bit inconceivable, but when you take a detailed look at the future possible trends of the United States and Global EROI ratios, it is down right depressing. I put a link to my article above which describes this in length, but I will reproduce 2 graphs again, as these are necessary to get the point across. The first graph is a forecast of net energy declines plugging in Cutler Cleveland’s figures of past USA EROI estimates on the future of United States oil production. Taking the 2010 gross minus net estimates we come up with approximately 200 million barrels in US Dollar figures as the cost from wellhead….roughly speaking. This seems quite reasonable as we will be receiving 88% net energy returned. Unfortunately, that is the good news. When we fast forward to 2025, a decade a half later, the numbers become bleak. By 2025 the gross production estimate for U.S. crude oil will be about 1.2 billion barrels and the net will only be 500 million. The EROI ratio has fallen off a cliff as well as the net energy available for use in the market. This not only means that 700 million barrels in US Dollars (if the dollar is still around) will be absorbed by the cost of the energy itself, but the United States has now past the break-even point. It cost more to produce the oil, than you get from using it. It is a NET LOSS. Basically GAME OVER for the USA. The zigzag graph with the dots represents the change in Global EROI ratio. The two dashed lines are the extreme minimum and maximum that the EROI could follow. 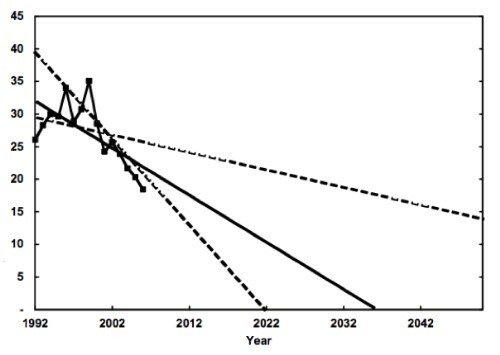 The solid black line is the probable extrapolation based on current estimates. Based on that estimate, the Global EROI ratio hits 1:1 on approximately 2036, only a decade and a half after the United States. Of course the 2 graphs shown above are only estimates based on the limited information gathered in a very complex and rapidly changing Geopolitical and economic world. Much more research needs be done to get a better understanding as to where we are heading. On the other hand, due to the probable rigging of the US Dollar, US Treasuries, and Interest Rate Markets over the past several decades, these future EROI estimates presented might turn out to be quite conservative. Do not forget, the EROI estimates shown in this article are based on converting energy figures into US Dollars. Most countries don’t have huge amounts of Gold bullion in their Central Banks, but boat loads of U.S. Treasuries. They classify these U.S. Treasuries as assets on their balance sheets. When the US Ponzi Finance system comes tumbling down, and all those $trillions of dollars of paper capital (US Treasuries, 401K’s, CD’s, Pension Plans, Muni Bonds, etc and etc) vaporizes into thin air, where will the real capital come from to invest into exploring, drilling and producing energy for the future?? This is a question I doubt many newsletter writing analysts ever ponder as they cash the next check they receive from their extremely uninformed subscribers when it comes to this topic. Believe me, I am not discouraging the newsletter for hire as a form of business, rather I am just amazed at the lack of insight and comprehension many of these analysts share when it comes to the seriousness of a falling EROI ratio in the future energy and mining environment. Okay…here is the information on PEAK SILVER. Always best to keep the best for last. Unless some Alien mining ship comes crashing down on earth unscathed and we have the smartest minds reverse engineer the technology within the next several years, in all likelihood, the world peaked in Global Gold Production in 2001 at 2,604 tonnes. Because gold is a special case due to its ranking as the King Monetary Metal, its peaking is not as significant as the global peaking of silver production. Increased production of precious and industrial metals can not go on forever. When these metals, especially silver head in an exponential production projectory, it is just a matter of time before the collapse take place. Nothing that abides by the laws of nature on earth can continue in this fashion. Looking at the exponential increase of Australian mining production, we can see this taking place. Silver in Grey has the finest exponential graph of them all. As most of you already know, silver is not only a monetary metal, it is also an industrial metal in high demand. Many economists and pit traders will tell you that silver is just a mere commodity. They say, its monetary status was lost decades ago. I would like to inform this kind of mindset, when the price of silver goes ballistic, amnesia, stupidity or ignorance won’t be acceptable excuses. 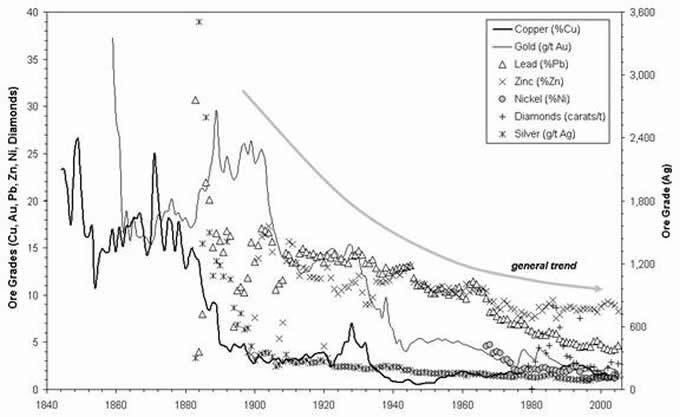 A far larger percentage of silver world production comes from by-product mining compared to gold. It is this very reason why silver will show the world when the production of world industrial mining is peaking. Huge copper or lead-zinc mines are not going to ramp up production just to produce more by-product silver if prices of silver head much higher. Mining companies will only increase base metal production if there is a demand for the base metal they are currently producing as the major source. How about this for an example. If you went to the store to buy red maraschino cherries, and they were out of jars of these cherries, you’re not going to buy a dozen cakes with the cherries on top just to get the amount of cherries you need. Not only is this extremely uneconomical….it’s insane as well. Understanding the ramifications of a falling EROI ratio upon the mining industry, it becomes very apparent that the silver reserves will be the only portion available for extraction and the majority of resources and the resource base will not. If the estimates in the graphs above for US and Global future EROI ratios are accurate, then we can assume only the reserves+ may be economical in the future. We have seen history in the making here. Normally whatever the government states, we know as of late is false. But here, we have some honesty from the USGS. Unfortunately, as energy becomes more expensive due to less net energy available due to a falling EROI ratio, even recycling will become expensive and prohibited. There will be plenty of challenges in the future for the modern technological society we live in as we transition to a world with less of everything right at the time when China and India are westernizing. The world is peaking in global oil production. The downside slope of the graph is much worse when you factor a falling EROI (energy returned on invested) into the mix. If the certain data listed above is correct we may see the USA hit a 1:1 EROI ratio by 2020’s and the world by the 2030’s. The real damage to a modern society starts when the EROI figures reach 3-5:1. When 1:1 is reached….the movie has been over for quite a while and the theater is officially closed for business. Liquid energy fuels are such an important part of our way of life, to transition to another type of technology or energy would cost countless trillions of dollars in an upgrade. People talk about changing the auto fleet to electric. This sounds nice on paper, but the economics, cost and logistics would make this theory, DEAD IN THE WATER. We have to start making wise decisions with the resources we have left. Until we find ZERO POINT ENERGY or some poor Alien Slob crashes his ship here on earth, we are going to have to tighten the belts, bite the bullet and get to work. The mining industry will follow the peaking of global oil and natural gas production. 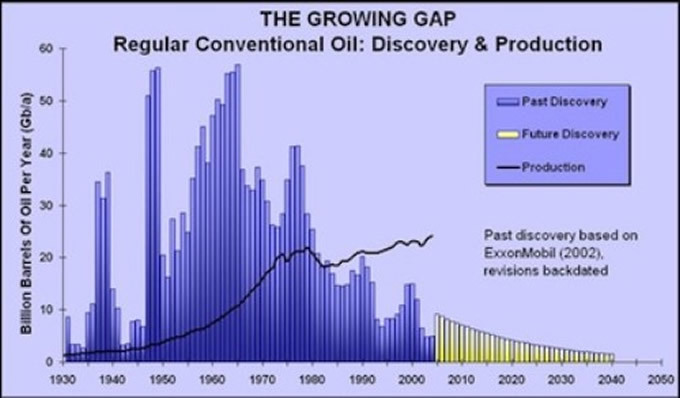 There was a peak in conventional oil discoveries in 1965 and a peak in conventional production in 2005. 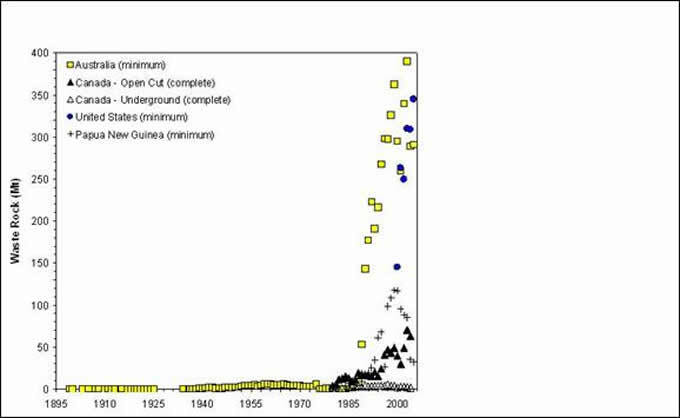 There was also a peak in world class mine discoveries in 1981. A great deal of capital has been invested in the past several years in both the oil and mining industry, but very little to show for it. The world is surviving on the back of large depleting oil fields and declining world class mines. 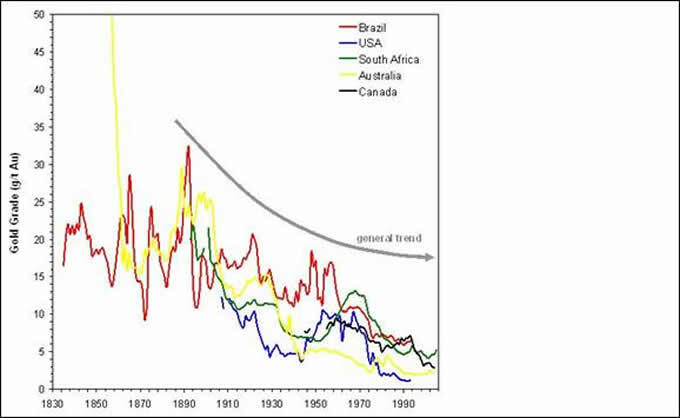 The peaking of world silver production will be the Canary in the Coal mine. Soon after, we will see the peaking of world industrial production. Even though the USGS states that there are over 550 million tons of copper reserves in the world supplying 35 years production at current rates, a rapidly falling net energy supply will very quickly erode the annual production rate. Sure there might be plenty of silver in the Mexican mountains, but it will be mined in the future at a very smaller annual rate. Many people confuse the Peaking of Oil with running out. This is not the case. It is the FLOW RATE that peaks. To add insult to injury, adding the falling EROI ratio to the equation, you’ll have a lot less oil flowing a heck of a lot slower as time goes by. I stated in the beginning of the article that I believe the world silver production peak may have occurred in 2008. The disintegration of the global economy has put a damper on base metal production along with by-product silver. I don’t see the global economy recovering anytime soon with money printing and derivative game playing as the primary source of real capital. If we don’t have a peak in world silver production in 2008, it will plateau and decline soon there after. © 2009 Copyright Steve St .Angelo - All Rights Reserved Disclaimer: The above is a matter of opinion provided for general information purposes only and is not intended as investment advice. Information and analysis above are derived from sources and utilising methods believed to be reliable, but we cannot accept responsibility for any losses you may incur as a result of this analysis. Individuals should consult with their personal financial advisors. Thanks for this great article, Steve. A picture is worth a thousand words, and the graph of increasing Australian silver production says it all. As Jim Sinclair said, "Buy silver if you want to be decimated." I imagine Chinese--and Asian--silver production may be similar. At some point, silver will be a buy, but not now. Certain well known big holders must be scratching their heads, wondering whether the storage fees are worth it. Comex shorts are laughing all the way to the bank--wait a minute, they are the bank. information down to it's essence then looks for similarities. Cut the fluff. Cut the bull. Strip away pretense. EROI works as a tool. It has great value. of graduated 'steps' in pricing over decades is OVER.